Libertarians, like other Americans, want to be able to walk city streets safely and be secure in their homes. We also want our Constitutional rights protected, to guard against the erosion of our civil liberties. In particular, Libertarians want to see all people treated equally under the law, as our Constitution requires. America’s millions of gun owners are people too. Law-abiding, responsible citizens do not and should not need to ask anyone’s permission or approval to engage in a peaceful activity. Gun ownership, by itself, harms no other person and cannot morally justify criminal penalties. The primary victim of these misguided efforts is the honest citizen whose civil rights are trampled as frustrated legislators and police tighten the screws. Banning guns will make guns more expensive and give organized crime a great opportunity to make profits in a new black market for weapons. Street violence will increase in new turf wars. Criminals will not give up their guns. But, many law abiding citizens will, leaving them defenseless against armed bandits. Libertarians agree with the majority of Americans who believe they have the right to decide how best to protect themselves, their families and their property. Millions of Americans have guns in their homes and sleep more comfortably because of it. Studies show that where gun ownership is illegal, residential burglaries are higher. A man with a gun in his home is no threat to you if you aren’t breaking into it. The police do not provide security in your home, your business or the street. They show up after the crime to take reports and do detective work. The poorer the neighborhood, the riskier it is for peaceful residents. Only an armed citizenry can be present in sufficient numbers to prevent or deter violent crime before it starts, or to reduce its spread. Interviews with convicted felons indicate that fear of the armed citizen significantly deters crime. A criminal is more likely to be driven off from a particular crime by an armed victim than to be convicted and imprisoned for it. Thus, widespread gun ownership will make neighborhoods safer. Foolish politicians and police now seek to ban semi-automatic “assault rifles”. They ignore the fact that only honest citizens will comply; criminals will still have them. Such a ban will only increase the criminals’ ability to victimize the innocent. 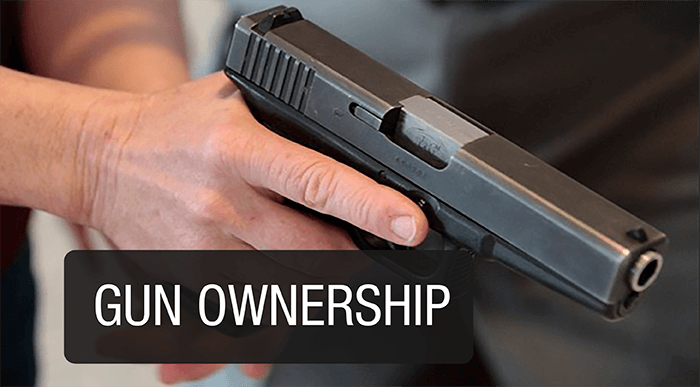 Let us put the responsibility where it belongs, on the owner and user of the gun. If he or she acts responsibly, without attacking others or causing injury negligently, no crime or harm has been done. Leave them in peace. But, if a person commits a crime with a gun, then impose the severest penalties for the injuries done to the victim. Similarly, hold the negligent gun user fully liable for all harm his negligence does to others.